Dutch side Utrecht have reported Swansea City to Fifa over the Welsh club's sale of goalkeeper Michel Vorm to Tottenham. The Eredivisie club say they have not received 30% of Vorm's transfer fee, which they claim was agreed as part of his deal to join Swansea in 2011. 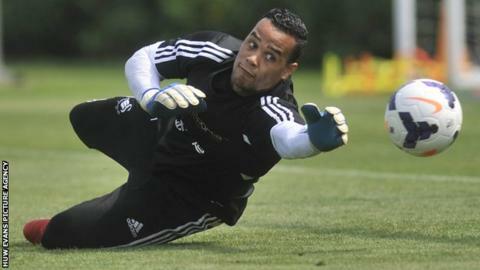 Vorm, 30, moved to White Hart Lane last month, for what Swansea said was an undisclosed fee. Swansea previously said Vorm's transfer did not break any rules. Vorm, whose only appearance during the World Cup for the Netherlands was as a substitute in the final seconds of the 3-0 win over Brazil in the third-place play-off, joined Swansea for £1.5m. Utrecht claim they agreed a sell-on clause as part of that deal and have yet to be paid a penny by Swansea following his switch to London. Speaking to BBC Wales, Wilco van Schaik, general manager of Utrecht, claimed he has been told by the Premier League club's chairman, Huw Jenkins, that Swansea let Vorm go "for free". "That's unbelievable and unacceptable," said Van Schaik, ahead of confirmation that they have referred the issue to Fifa. "Michel is a very reliable goalkeeper in the Premier League. He is 30 years old, in the prime of his life. "He still had a two-year contract and has a good reputation. "Besides that, he's a solid member of the Dutch squad. We want to have the 30% as we agreed." Before they were reported to Fifa, a Swansea City spokesman said Vorm's transfer was "conducted and concluded correctly" under Premier League rules. "It was approved by the Premier League and also Fifa via their TMS system," he said. "While we have been in contact with Utrecht as a matter of courtesy, we will continue to conduct our business in the best interest of our football club and our supporters and not based on the views of other clubs. "The club will not be commenting further on this matter." Spurs also signed Ben Davies from Swansea in a swap deal, with old boy Gylfi Sigurdsson returning to the Liberty Stadium.